For more than two decades MAI has provided specialized marketing and communications services to companies just like yours. We are pleased to offer a full range of creative and strategic services that are custom-tailored to your specific goals, objectives and budget, all with an unparalleled level of responsiveness. We specialize in the aviation industry, but are proud to provide solutions for many other industries as well. A short video was produced in order to visually highlight the capabilities. 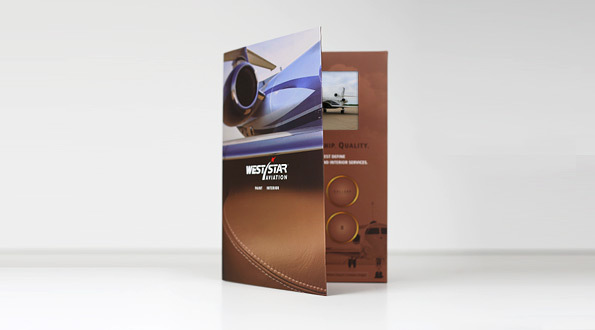 Combining a printed collateral piece with a vibrant LCD video display, this Interactive Brochure was the perfect solution to deliver an extraordinary level of detail to potential high-end aircraft Exterior & Interior prospects. Our creative team produces a logo that becomes a recognizable identity for your specific company. Our designs consistently reflect your company’s underlying philosophies, positioning and brand characteristics while communicating your products or services in the most effective way possible, throughout all communication mediums. MAI’s on-staff design team specializes in creating eye-catching, effective collateral materials from inexpensive tri-fold brochures to custom-designed flagship corporate brochures. That same creative flair is also applied to print ad design and production. With more than two decades of experience with industry press and media, you can trust MAI to develop and draft your press releases, press conferences or media events. Our full service video department assists in all aspects of video preproduction and project management. This means first determining if video is the right tactic for your objective. For more than two decades, we have exhibited at and still attend the same shows you do. Our experience in all aspects of tradeshows brings a unique perspective to the planning and management of your show strategy and budgeting as well as new exhibit planning, construction and operation. Trust MAI for the design and development of everything from simple promotion-specific microsites, corporate websites, database driven solutions and even native mobile apps. As a licensed ASI distributor, MAI can save you money by sourcing virtually any item needed for promotions, tradeshow giveaways or corporate gifts and apparel.